Every year some important days coming in our daily life such as birthday,marriage day,Christmas,thanksgiving day and so on,in that particular days we will invite guests and served them a number of delicious dishes with using various mismatched bowl sets,but these are all not serve for our purpose because some utensils larger than required quantity and some bowls not sufficient for mixing or serving particular food item,in this process sometimes procured so much annoyed,so finedine company propound 6 set of stainless steel nesting mixing bowls,these out and out multipurpose bowls to check agony and partake of what you prepared in the kitchen. Each bowl has half sphere shape and rounded bottom with steady base,so more stable on the flat surface.Larger bowl height 5 inches and it will be store remaining bowls,so no need to ransack the kitchen cabinets or cupboards to find them every time. These are lighter than glass or ceramic or plastic but does not break like other items and also safer than plastic.Inside of the each bowl has mirror finished,so reflects clear image and the outside design is brushed finish but not happen corrosion. This kitchen bowl set also used as measurement cups. This mixing bowl set quality belongs to aesthetic stainless steel,so not shown magnetic properties even fridge magnet also doesn't stick to it and resist from rusting but do not sustain the overheat ,so better to avoid on direct stove top cooking,otherwise they will bent and charred the bottom.Don't clutch directly at the time of pouring or put any hot substance because heat transmitted along its whole length. Among the 6 set of nesting bowls,the larger one is in accordance with basin structure that means size huge than your expectation,so you can mixing large amount of different food items at a time and assist purveyor for supplying of plenteous provisions.Medium sizes are good for preparing salads and store raw products etc,and the smallest dish is assist you for whipping 4-5 eggs at the same time.Generally in most of the occasions,housewives used just a slice cake pan for making eight types of flavoured cakes,in that time this is highly helpful. 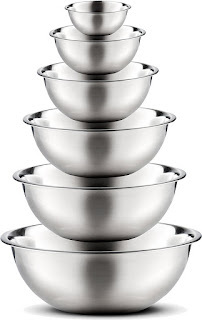 You know desultory plannings didn't help us in any time but these Best stainless steel nesting mixing bowls put an end your stress and not squander money.So let's sign in the new splendid day in your life and enjoyed the sumptuous feast with your guests.